Now, I’m a man who is somewhat obsessed with folklore, especially when it’s blended with a good ol’ bit o’ horror. So, when I found out that From the Dark was a folklore tale of the Irish variety, I just had to jump on board! From the Dark is a simple premise of two young lovers, Sarah and Mark, visiting the Irish countryside when their car breaks down and Mark goes off on his own to find help. He comes across an old country home where he lets himself in and finds an injured old man and yes, I can tell by your face that you’re bored already and you know exactly where this is going. Yup, it’s a movie that’s been done a thousand times before and that's probably just in this past week alone. 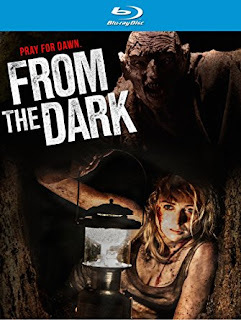 From the Dark offers absolutely nothing in the originality department, in fact borrowing at least half the script from other films, and the rest is merely compiled from The Horror Vault of Clichés. The direction is pretty pants as well, throwing in a calamity of inconsistencies that make this already mundane vampire-esque flick all the more unenjoyable to the point where you just find yourself sighing (a prime example, one of the characters hurts their shoulder, which suddenly means they have a limp. Makes sense). However, one saving grace has to be from our leading couple, portrayed by Niamh Algar and Stephen Cromwell (or Non-Conventional Name and More Conventional Name), who give pretty bloody good performances, for which I can imagine they were very tragically underpaid. It’s also hard to take our villain seriously as he seems to heavily arm himself with pantomime-styled theatrics that just leave you rolling your eyes as he totters around like a Disney animated penguin (not even joking). Pretty short review, I know, but this small casted, painfully obviously low budget shite-fest (if I’m to don the Irish accent for a moment) left me feeling rather ripped off in the sense of paying extravagantly for a lavish meal and still walking away hungry for something else entirely. At this point, the kebab house with the girl behind the counter who only has half a face, with the injury still fresh, seems more palatable.